Delicious honey-flavoured cereal hoops, packed with fibre and delicious on their own or dipped in milk or yogurt. A concentrated energy-source made from Thai rice, oats, maize and Ecuador tapioca, blended with the satisfying sweetness of honey and cane sugar for a balanced flavour that brings you the energy you need for a great day. Most of the ingredients are sourced from producers in Asia, Africa and South America, for a nourishing, lip-licking breakfast enhanced by the satisfaction of solidarity. 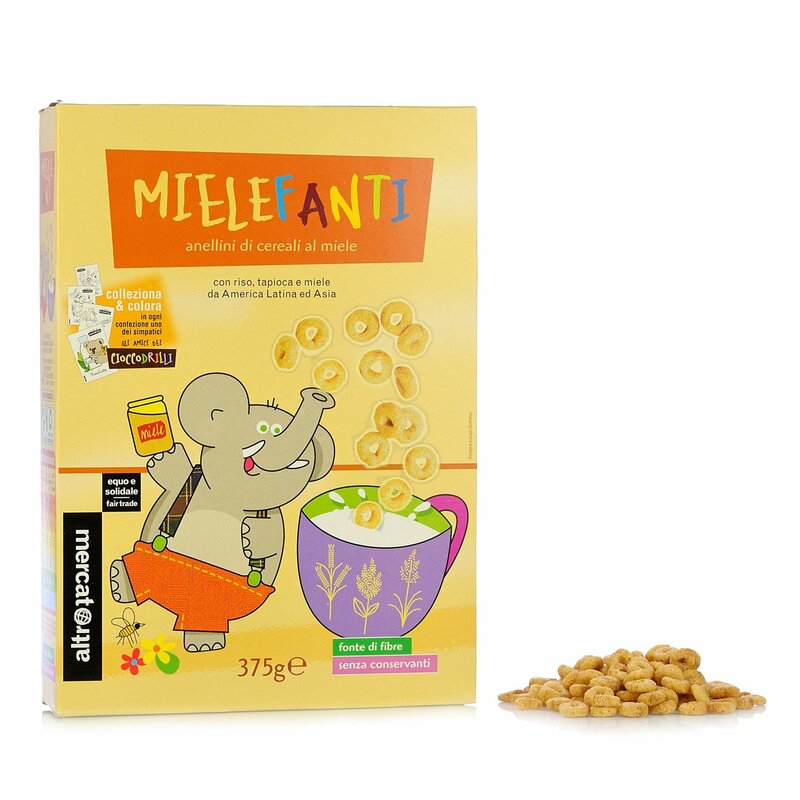 Ingredients *Rice flour (25%) – Oat flour - *Cane sugar – Corn flour - *Tapioca flour - *Honey (6%) – Glucose syrup – Wheat germ – Salt – Soya lecithin – Flavouring *Total Fairtrade ingredients: 59% Allergens: cereals containing gluten, soya derivatives. May contain For more information on product labels, please contact our Customer Service department. The information on the labels of the products may vary for reasons beyond our control, therefore, there may be discrepancies between the information on the site and that on the products delivered. Please always check the information on the product before consumption or use. Altromercato has a long history as a point of reference in the fair trade market, which aims to promote sustainable development in the southern hemisphere as in the north. The company produces a broad range of foods including beverages made using traditional recipes and with carefully selected ingredients, and sweet products for breakfast or a tasty snack during the day. Eataly chose Altromercato because of the unique flavour of their wholesome products that also promote fairness in the world.